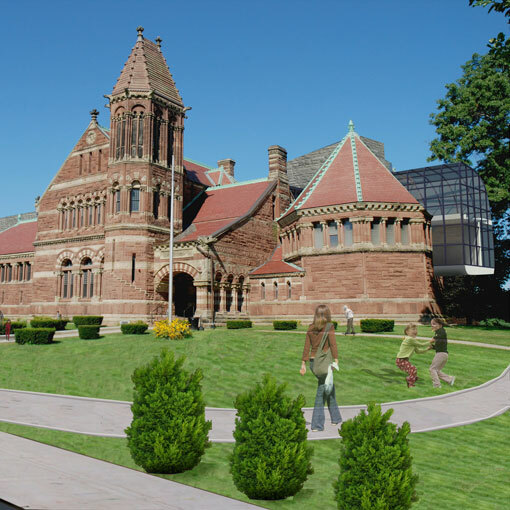 Proposed conceptual design for the Woburn Library addition functions as a catalyst for improvements throughout the downtown area. 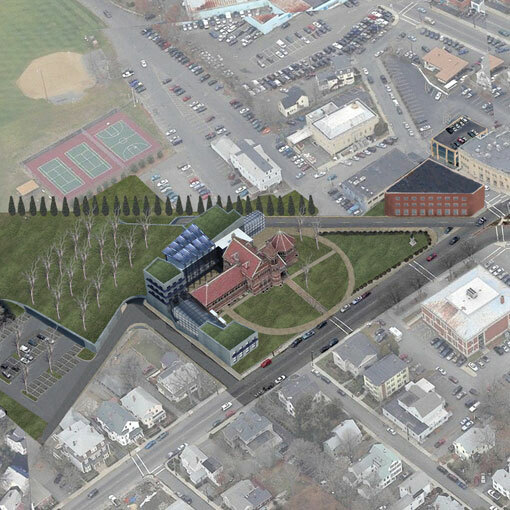 By moving the assisted living facility to the corner of the town square and removing the gas station, the existing village green can be mirrored in front of the library. The new parking lot behind the library gets a grass covered roof, restoring the original design intention for the library to be set in a park-like context. Fostering this connection allows the library to act as a transitional element between park and village green. The new addition wraps the side and back of the existing library, allowing it to act as a backdrop and frame to the original design. The addition is composed of three “stone” towers, which house the new entry, community room and other key programmatic elements. The towers scaled to their context; the one on the street is residential in scale, while the other two are scaled relative to for the existing library. The glass connectors house the reading rooms and mediate between the towers and the library, their curved forms acting as a counter point between the new and old stone structures.